Choosing invitations for your special day will have you looking at various designs and styles. You will find everything from casual cards to formal and elegant engraved cards. Your choice will depend on several things including the type of ceremony you are planning and personal taste. Many couples decide on photo wedding invitations for their guests. This is a nice way of sharing an engagement photo with all the guests. Several styles of photo cards are available for couples to browse through as they choose their favorite. 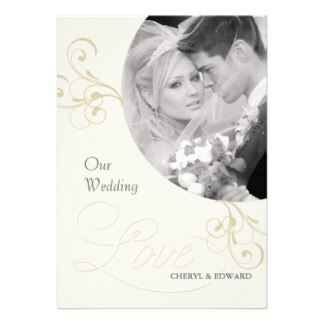 Many online web sites have this type of card for weddings that include Photo Card Creations, Mixbook, and Walmart. The Walmart web site allows you to create special cards for your guests. One design is a 5×7 inch photo card that you can order on stationary card stock, photo paper, or premium metallic photo paper. This design includes one photo of the couple with the ceremony details. The web site has easy to follow instructions that help you personalize your cards. You need to have an account to use the service and registering for a free account is easy. When you order from the web site, you have the option of site to store delivery or home delivery. The Mixbook web site offers a large selection of photo cards for you to personalize for your special day. Elegant Collage cards include more than one photo of the happy couple along with details for the ceremony. The cards are available on satin coated paper, signature matte, or premium. You choose the layout, background, and text for the invitations. Register for a free account to use the service that has instructions to help you with the creation process. 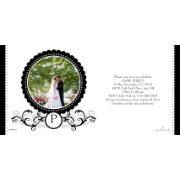 The Mpix web site has a selection of photo invitations for you to personalize for your special day. The Floral Wreath design has a light gray or dark purple background and a border of flowers with pale green leaves. You choose the flower color from pink, aqua, yellow, or white. The back of the card features a full-page photo of the couple. You have to be logged into your account to upload photos and personalize your invitations. When you use the Invitation Consultants web site, you can choose one of the many designs including the My Beloved design. The card features a verse from the Song of Solomon. This modern style invitation includes a picture of the couple along with the details for the ceremony. The photo will be on the right side of the card with details printed on the left. The web site includes easy following instructions for you to personalize your cards. 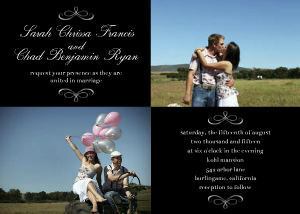 Use the Photo Card Creations web site to create modern and elegant invitations for your wedding. The Forever Mine design features a romantic look with your photo on the front of the card and ceremony details on the back. Paper options for the cards are glossy, semi glossy, white linen, pearl, and recycled white matte. The web site has an online design tool that makes it easy to customize your design. You can choose the background, border, colors, and text for your cards. This Elegant Vintage style of wedding invitation comes in ivory. A picture of the couple is on the front of the invitation. The cards have an elegant ecru background with vintage scrolls and gold wedding bands as embellishments. Ceremony details are printed on the back of the card. 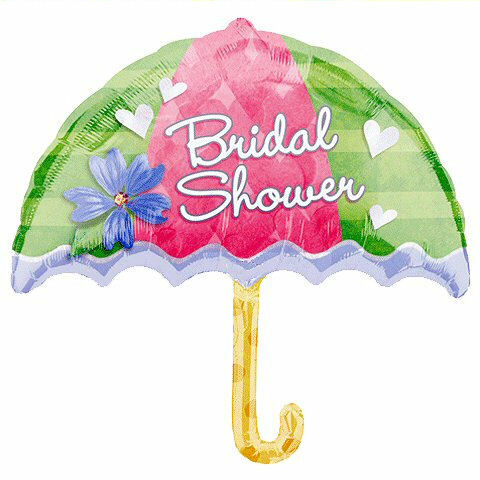 The Zazzle web site has simple instructions that will help you create the ideal invitation for your ceremony. The Photo Card Chef web site includes several beautiful designs for invitations with photos on them. Unique folded invitations feature room for up to four photos on the inside of the folded card as well as one photo on the front and one on the back. You customize the text on the front and inside of the folded card. The finish on the cards is available in semi gloss, high gloss with a protective UV coating, smooth matte, linen texture, and pearl. 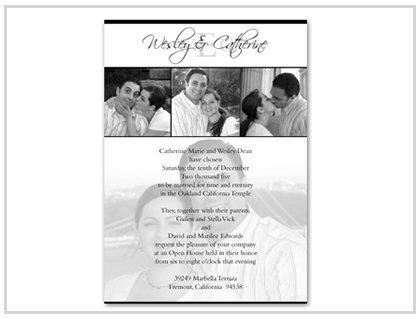 The CVS Photo web site has a selection of invitations for weddings that you can personalize with photos. 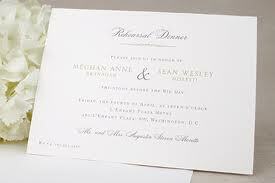 The Black and White Monogram design provides a formal looking invitation. You are able to choose landscape or portrait for your cards. The web site has easy to follow instructions to walk you through the process of customizing your wedding cards. The lovely Floral Corners is one design of wedding invitation you will find on the Ann’s Bridal Bargains web site. The modern design features a z-fold invitation. The front panel has a banner that displays your names with your new titles on the third panel. You choose the font and color for the text. There are easy to follow directions to help you create the ideal card. The Basic Invite web site offers a variety of designs for your photo wedding invitations. The Savannah features four panels for you to customize. The card is decorated in a vintage style with floral design and a textured overlay over your photos. You are able to choose the fonts and colors for your invitation. White premium matte or semi-gloss and shimmer premium are the paper options.